A great mixture of protection and light weight, the Arc’teryx Incendo Vest is a great option for hikers or trail runners. This is a simple piece of gear you can keep in your pack as insurance against cold weather, or a great vest to wear for mountain runs where it gets cold in the alpine. There are times where you need some warmth and some protection from the weather but can’t be slowed by a heavy jacket. 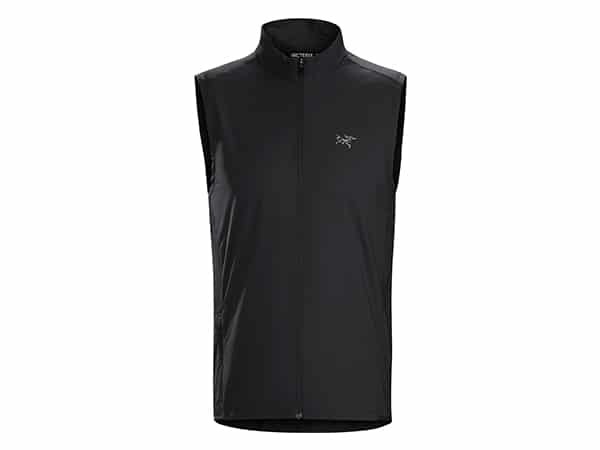 In those cases, grab a lightweight, breathable running vest like the Arc’teryx Incendo Vest. The Incendo is a lightweight softshell vest, designed to provide protection from wind, moisture as well as light warmth on chilly runs. It reminds us of a Squamish hoody without sleeves or a hood. 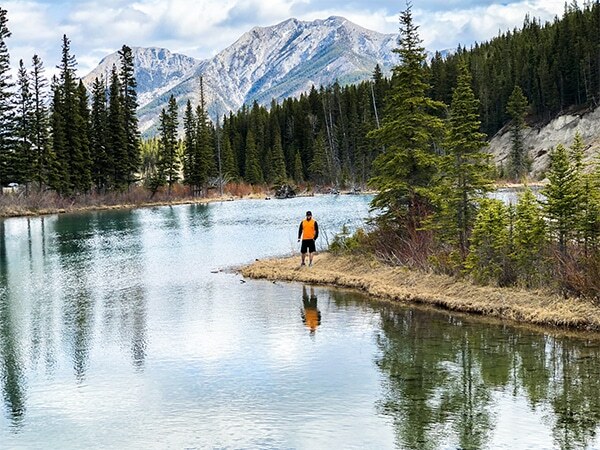 On wet and chilly runs in summer or early shoulder seasons, or as added light warmth on a hike. Lightweight and Packable. At 85 grams, the Incendo weighs practically nothing. As Arc’teryx shows on their site, it’s not much larger than a Clif Bar when packed. Weather Resistant + Ultra Breathable. The nylon ripstop blocks wind effectively and rocks a DWR finish, but breathes like a champ too, with mesh side panels and no arms. Versatile. 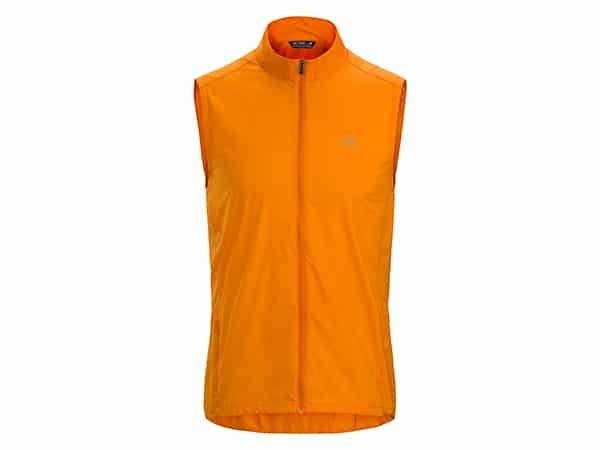 Running, hiking, even mountain biking – this vest is solid piece of kit for almost activity. If you run hot, the Incendo Vest keeps the core warm while allowing moisture to vent easily as this is a vest. Not Much Hi-Vis Marking. Seeing as how it is designed primarily for running, those could be life-saving when running on a road. Small Zippers Pulls. This is mainly an issue when wearing gloves, but they can be difficult to grasp in those situations. The Incendo Vest is made from Arc’teryx Lumin fabric – a light, thin nylon ripstop. When we say light, we mean it; this thing weighs 85 grams / 3 ounces. It’s not really meant for “insulation” so much as a bit of warmth to break the wind on chilly day. The fabric provides excellent wind resistance but is still amply breathable; Arc’teryx describes it as “balancing wind resistance with air permeable comfort”. And it’s been treated with a durable DWR coating, so water beads up and rolls right off. They didn’t skimp on ventilation, either. The mesh side panels provide plenty, no matter how much of a sweat you work up. And Arc’teryx used what they call their Composite Mapping Technology, which is supposed to “strategically place each fabric” for best in breathability and protection. All we know is it is comfortable to run in, both on chilly and wet and warmer days. And of course, since this is a vest, there are always two very large vents built right in – the armholes. The Incendo Vest is ultra-packable and versatile – just the way we like it. 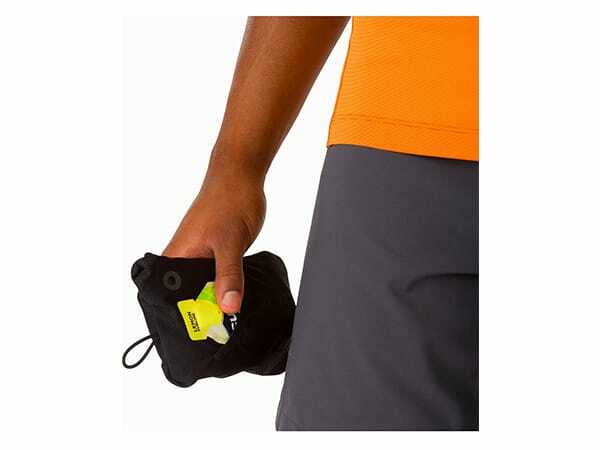 It packs down into its own pocket and takes up very, very little room in your bag; as we mentioned before, you can look at the product page on Arc’teryx.com and see how it how it compares in size to a Clif Bar – barely any larger. We love gear with a small footprint and love that we can throw it in almost any pocket. Arc’teryx also stuck with the Incendo Jacket’s basic design for the vest. That means low-profile and minimalist. 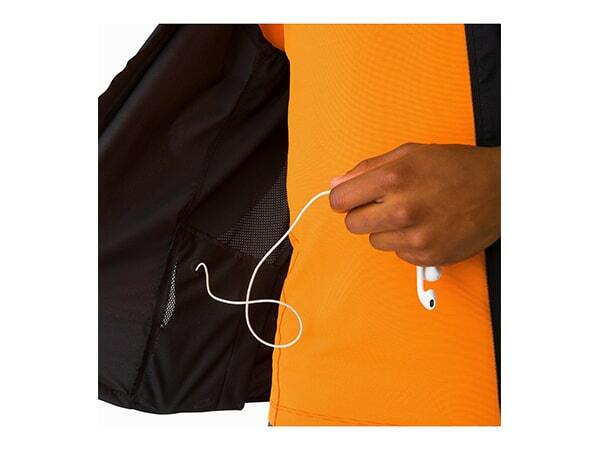 There’s a zippered media pocket where you can store your phone and run your headphones through a port. But that’s really it; simplicity is the name of the game here. The hem is elasticized and adjusts with a drawcord to keep the heat in and the cold out on blustery days. The Arc’teryx logo is reflective, as are two small blazes on the back of the vest. This helps with visibility when running in the dark. If you run on the road a lot, you might more reflective elements for added visibility. If you stick to the trails like we mainly do, this is a non-issue. Our only real complaint with this vest is the small zipper pulls. They’re fine with bare fingers, but if you’re wearing gloves – even a very light, thin pair of running gloves – they can be tough to grasp at. Another winner from Arc’teryx. The Incendo Vest is as good as we could a lightweight running/hiking vest to be. 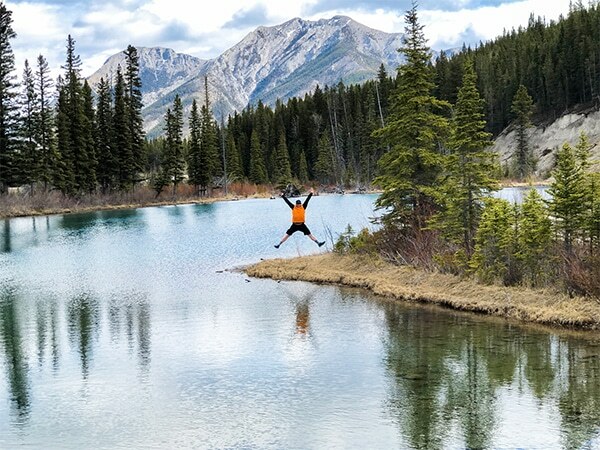 It’s super breathable, wind-resistant and water-repellent, and adds just the right touch of warmth on a chilly spring day or when the weather blows in on a summer hike. It’s a mainstay in our packs and we break it out quite frequently.